VANCOUVER, BC / ACCESSWIRE / January 31, 2019 / Ximen Mining Corp. (TSX.V: XIM) (OTCQB:XXMMF) (the "Company" or "Ximen") is pleased to announce its Option Partner New Destiny Mining Corp. has received the second batch of analytical results from the 2018 exploration program on the Company´s Treasure Mountain Silver Base Metal - Precious Metal Property, southern B.C. The results are for rock grab samples collected in the southeast region, including significant analyses for base and precious metals, tellurium and anomalous indium values. The first batch of 2018 sample analyses included significant gold analyses from the east-northeast regions. Rock sample highlights from the 2018 program include. - 11.3 & 8.81 grams per tonne (g/t) gold in the east-northeast regions (News Release of July 26, 2018). Up to 1.45% zinc, 122 g/t silver, 0.87 g/t gold, 57 g/t tellurium and 12.3 g/t indium in the southeast region. The Treasure Mountain Silver Property partially surrounds the Treasure Mountain Property of Nicola Mining Inc. which hosts polymetallic veins and the historic Treasure Mountain silver-lead-zinc mine (TSXV:NIM). 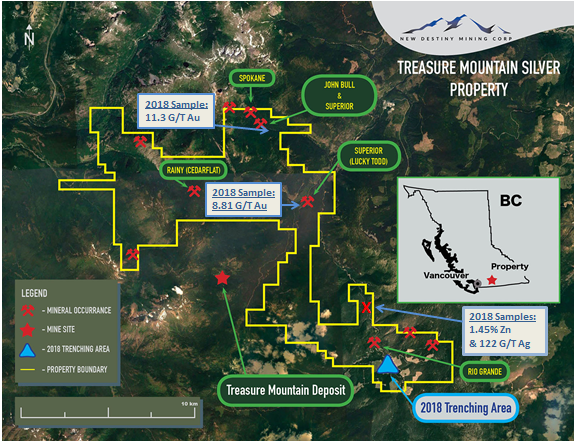 The Treasure Mountain Silver Property is also located approximately 37 kilometers southwest of the Shovelnose Gold Property of Westhaven Ventures Inc. (TSXV: WHN). Westhaven Ventures recently reported a diamond drill intersection of 8.95 g/t gold and 65.47 g/t silver over 46.2 meters (core length) at the Shovelnose Property. The Treasure Mountain Silver Property hosts multiple occurrences of silver, gold, lead, zinc and / or copper; and two copper - molybdenum occurrences. Copper and nickel mineralization is also reported locally in the northern region of the property. New Destiny also conducted trenching during 2018 in the southeast region of the property. Numerous outcrop grab samples from one trench returned anomalous gold values. This included three samples returning 0.877, 0.46 and 0.359 g/t gold. The host rock in this trench is a pyrite bearing schistose rock. The 2018 rock samples were analyzed at ALS Canada in North Vancouver. The samples were analyzed for gold by Fire Assay - Atomic Absorption (AA) and for 48 elements by ICP-MS. Samples over the upper limits for silver and / or zinc were re-analyzed for these elements by four acid ICP-AES. - Rainy (Cedarflat) occurrence (north-central region): 2011 grab samples from rock piles near an adit were reported to return 6.5, 7.4 and 11.9% zinc. - Spokane (northeast region near Jim Kelly creek): A sample reported in 1913 of 4.11 g/t gold over 0.9 meters across the zone. - John Bull (northeast region near Jim Kelly creek): A channel sample reported in 1937 of 9.6 g/t gold over 0.18 meters across a quartz vein. - Railroad creek area copper showing (east region north of Railroad creek): Two 2011 grab samples from rock piles near adits were reported to exceed 1% copper and up to 76.4 g/t silver. 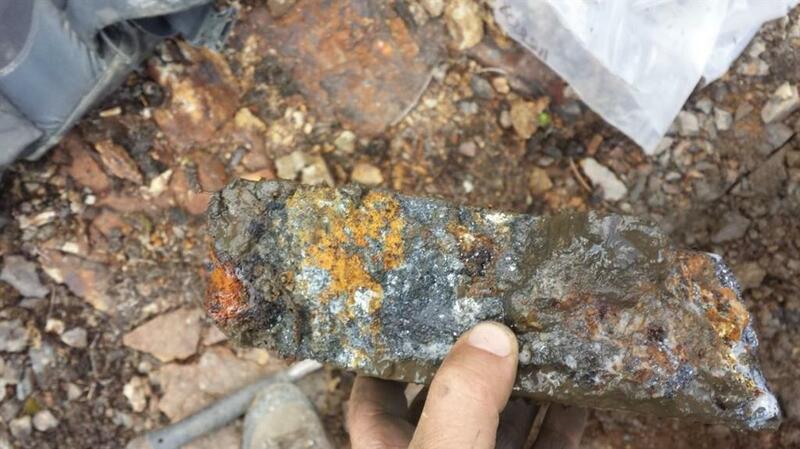 - Rio Grande (southeast region): A 1.5 meter chip sample across a shear zone was reported in 1929 to return 1.2% zinc. Allan Beaton P.Eng., a Qualified Person as defined by NI 43-101, is responsible for the technical information contained in this News Release.